Rapaport News is the premier diamond news source, reporting 24/7 on the diamond and jewelry industry. In addition to breaking news coverage on Diamonds.net, Rapaport News also offers readers two types of complimentary digital newsletters. 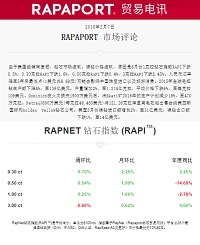 The Rapaport NewsBrief is a daily email (Monday-Thursday) comprised of the top diamond and jewelry industry stories on Diamonds.Net, the latest RAPI Diamond Price Index, financial data, and Rapaport Investment Grade Diamond listings on RapNet. The Rapaport | TradeWire® is a weekly email directly to your inbox that offers a comprehensive overview of the week’s major industry events in a succinct format. Sign up today and receive the information that is the key to your success in the diamond business. If you already receive one or more Rapaport e-newsletters, please click here to update your preferences.